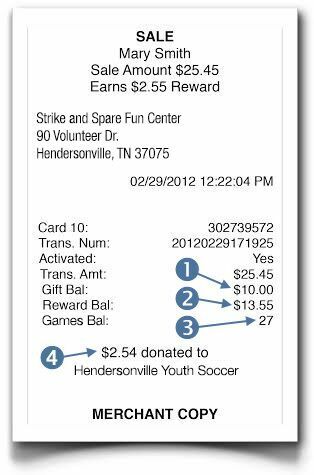 Bowling Rewards offers complete gift card processing capabilities with the added convenience and benefits of cash back rewards and fundraising applications on the same card or card-less ID. For merchants running card-less, the patron is identified by their mobile phone number once they activate their account. Customers receiving cards do not need to activate their account in order to redeem gift value but do need to activate it in order to redeem rewards. This neat feature helps you build a customer database from gift card recipients and saves money on plastic so patrons can continue to reuse their gift card for ongoing reward earning opportunities. Each card or card-less account is capable of holding three separate balances. Here is what they mean. The Gift Balance: The Gift Balance is charged up with value when patrons buy a gift card or load their account with value in advance based on a gift promotion. Gift cards can be issued separately to patrons without any reward earning abilities or combined with rewards, thereby encouraging patrons to hold onto their card and activate their account to receive ongoing rewards. The Reward Balance: The Reward Balance can accumulate for lots of different reasons, including issuing cash back rewards from spending activity. Rewards can also fund patron accounts when customers activate their loyalty account or just because it’s their birthday, anniversary, or St. Patrick’s Day. We know you’ve already got enough to keep track of, so rewards are always issued in straightforward cash currency (i.e., $10.00) rather than confusing points. The Games Balance: The Games Balance shows how many free games of bowling are available in your loyalty account you can redeem at the front desk. Similar to rewards, games can also accumulate for all kinds of reasons such as birthdays, holidays (e.g., New Year’s Day, Cinco de Mayo), or maybe because you were among a center’s top sp ending visitors last month. When buying an optional premium membership, customer accounts might be funded with dozens, even hundreds of games with a redemption limit of 1 or 2 allowed per day. Fundraising: Did you notice the footer message on this printed receipt? It shows this patron account is affiliated with a local fundraising organization. This means that every time this customer spends money at a participating merchant, a percentage of the sale donated back to a local organization of their choice. You’ll be a hero for helping customers support their community with every purchase. Learn more. Load $20.00 in rewards when a customer purchases a $100 gift card (for themselves or someone else). This strategy is a huge money maker for the business and yet offers a much higher return to the customer than leaving money in the bank. Instead of selling a card with monetary value (i.e. $50), consider loading 50 Games for $50 for 1 day promotional period or 100 game package for $200 that offer significant savings in exchange for filling your register with cash. For the more experienced operators, create a paid membership customers pay for in advance that simultaneously drives frequency. For example, consumers might buy $100 in gift value and receive 20 “Games of Bowling” or 20 “Appetizers” with a programmed limit of 1 redemption allowed per day or per week. The redemption limit keeps customers coming back more frequently to redeem their free item. Visit membership marketing for more details. Contact us anytime to discuss your firm's gift and loyalty needs in more detail.